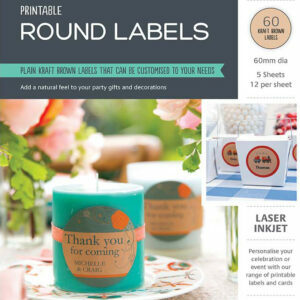 Add a natural feel to your party gifts and decorations with Avery printable Round Labels. Made from recycled brown kraft material for a rustic finish and featuring print-to-the-edge capability for a full colour professional finish, these labels are the perfect way to personalise your special occasion. 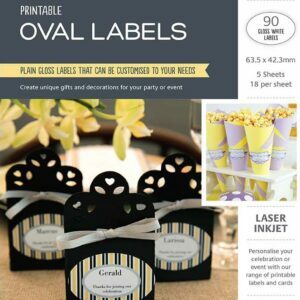 Create unique gifts and decorations for your party or event with Avery printable Oval Labels. Made from gloss white premium quality material with permanent adhesive and featuring print-to-the-edge capability for a full colour professional finish, these labels are the perfect way to personalise your special occasion. 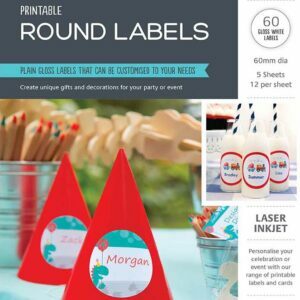 Create unique gifts and decorations for your party or event with Avery printable Round Labels. 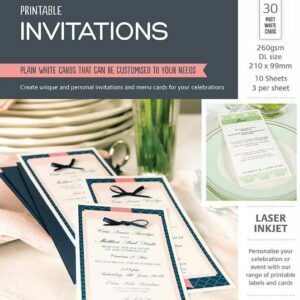 Made from gloss white premium quality material with permanent adhesive and featuring print-to-the-edge capability for a full colour professional finish, these labels are the perfect way to personalise your special occasion. 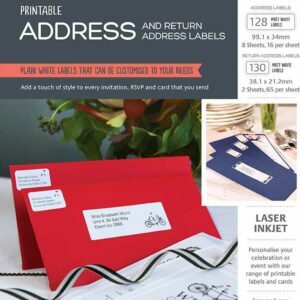 Add a touch of style to every invitation, RSVP and card that you send with Avery printable Address and Return Address Labels. 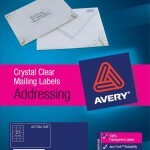 Made from a 100% transparent, glossy, durable material, these labels are the perfect way to personalise coloured envelopes with a crystal clear finish. 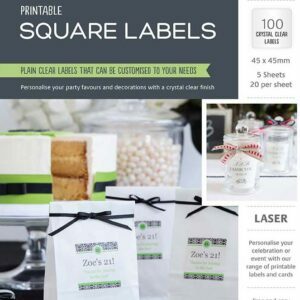 Personalise your party favours and decorations with a crystal clear finish with Avery printable Square Labels. 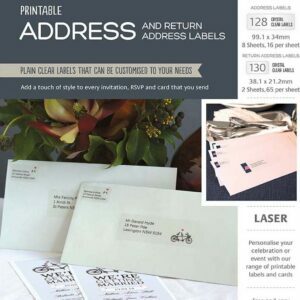 Made from a 100% transparent, glossy, durable material that is oil, dirt, splash and tear proof and featuring print-to-the-edge capability for a full colour professional finish, these labels are the perfect way to personalise your special occasion. 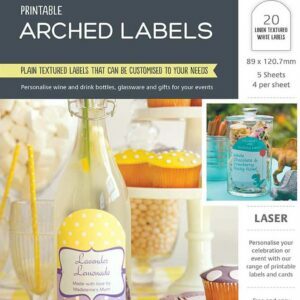 Personalise wine and drink bottles, glassware and gifts for your events with Avery printable Arched Labels. 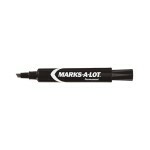 Made from premium quality waterproof textured material and featuring print-to-the-edge capability for a full colour professional finish, these labels are the perfect way to personalise your special occasion. 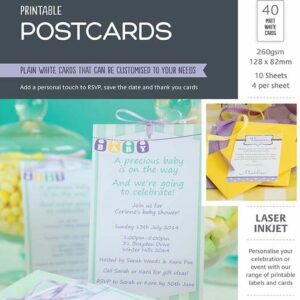 Create memorable gifts, party favours and wedding bonbonnieres with Avery printable Party Bag Kits. 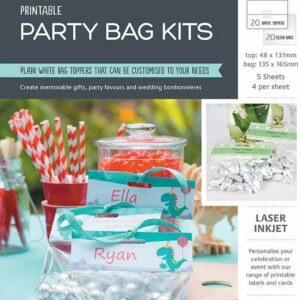 Featuring easy to assemble adhesive bag toppers made from premium quality matt white material, and sealable poly bags, these party bags are the perfect way to personalise your special occasion. 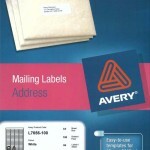 Add a touch of style to every invitation, RSVP and card that you send with Avery printable Address and Return Address Labels. Made from matt white premium quality material for a full colour professional finish, these labels are the perfect way to personalise your special occasion. 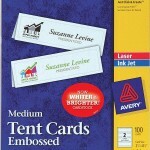 Create unique and personal placecards for your guests with Avery printable folded Placecards. Made from matt white premium quality material and featuring Quick & Clean technology for a smooth edge professional finish, these cards are the perfect way to personalise your special occasion. 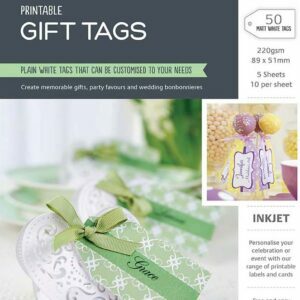 Create memorable gifts, party favours and wedding bonbonnieres with Avery printable Gift Tags. Made from matt white premium quality material and featuring print-to-the-edge capability for a full colour professional finish, these double sided tags are the perfect way to personalise your special occasion. 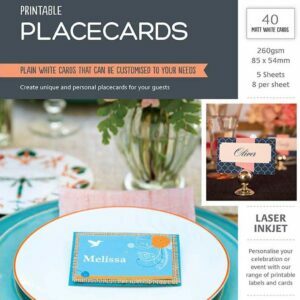 Create unique and personal placecards for your guests with Avery printable Placecards. 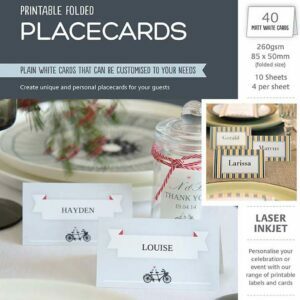 Made from matt white premium quality material and featuring Quick & Clean technology for a smooth edge professional finish, these cards are the perfect way to personalise your special occasion. 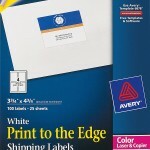 Add a personal touch to RSVP, Save the Date and Thank You cards with Avery printable Postcards. Made from matt white premium quality material and featuring Quick & Clean technology for a smooth edge professional finish, these cards are the perfect way to personalise your special occasion.